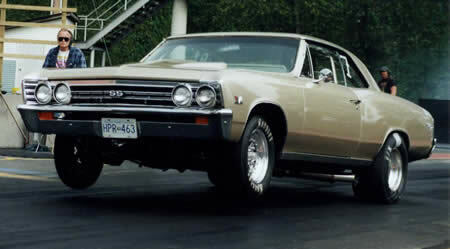 This is a video of the first dyno test of our first Chevelle motor. It was fairly mild, in the order of 600hp when it had it's baby cam profile and dual plane intake. Eventually it was pushed closer to 700hp 'on the motor' and 1200hp on 1 stages of nitrous (which proved to be very unreliable as it lifted the heads and caused the gaskets to burn thru) - and eventually we changed to a completely new 548cid motor the next year. Our beautiful Chevelle started off with a fairly mild 502cid motor than ran 10.5s @ 128mph 'on the motor' and eventually got to 9.12s @ 150.7mph with a bigger cam, head work, intake/carb and 2 stages of nitrous (going from 600hp to 1200hp in the process). This video highlights some of the earlier phases of this car at the track as well as some other cars at Mission Raceway.